Did Your Parents Give You a Whole Life Insurance Policy? Here's What to Do With It. Home » Personal Finance » Investment » Did Your Parents Give You a Whole Life Insurance Policy? Here's What to Do With It. For many of us 30-somethings (and some of us both younger and older), our parents took out whole life insurance policies for us when we were kids. When we became income-earners and were deemed responsible enough, a ceremonious transfer of papers occurred, where we were told gravely that this policy is to be kept paid up, as it will be worth a lot of money. Sometime. What is this insurance all about? Why will it be worth a lot of money? Should I just cancel it and take the cash? Or is there something else I don’t know? Whole Life is a type of permanent insurance. It combines a basic life insurance component with a cash (or dividend, or investment) component. Even though it is a permanent policy though, most are structured so that you only have to make premium payments for a temporary time (in the case of the policy your parents got you when you were still crawling, probably something like 20 or 30 years). Each year from the time the policy is born, the insurance company pays out dividends. And like any dividend, these dividends represent a share of the insurance company’s profits. Those dividends are squared away into the cash component of the policy, and allowed to compound in growth by earning more dividends and interest income yet. The larger your cash value, the larger the annual dividends will be. So it stands to reason that as long as the policy’s projected dividends pay out, there could be a lot of cash in there when you reach retirement age. Heck – even in your thirties, you could be receiving policy statements showing you thousands of dollars in the “cash surrender value”. By the time you reach retirement, it could be close to $100,000. (I must also note that in the 1980s, there were a series of policies sold by unscrupulous insurance agents who promised dividend payouts that were unrealistic. This sparked a whole life insurance scandal and a small fall-out in the industry. Today, whole life insurance policies are still very much viable products, as projections are more closely monitored so that policies are not sold with unrealistic expectations). Why do premium payments stop? Your policy is probably structured so that you won’t have to pay premiums after a while. Maybe the premiums stopped before you even inherited the policy from your parents. But the life insurance part is still there, and the investments keep growing. How is this? The premiums are stopped under the “premium offset” option. Once the cash value is big enough, the dividends and interest income it earns each year is more than sufficient to cover off the life insurance premiums, with some left over to still be invested in the cash value. One the policy reaches this state of maturity, you can opt to offset your premium so you don’t have to fork over your own cash any more. This does, of course, make the cash value grow a little more slowly. Why did my parents get me a whole life insurance policy? Your parents may have bought you this policy for a few reasons. They are guaranteeing your insurability. 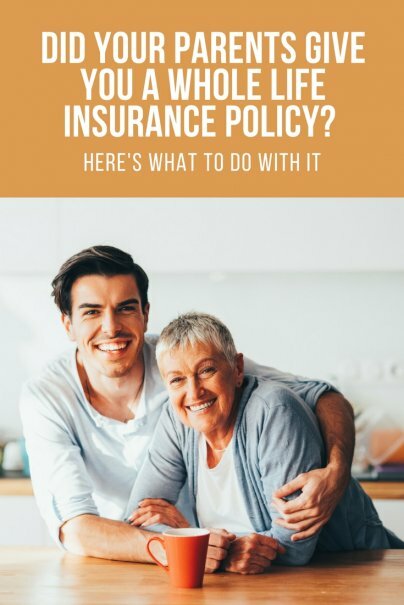 If, during your upbringing, you contract an illness that affects your ability to get life insurance for the rest of your life, your parents will already have jumped the gun by getting you this policy. (Cash value aside, let’s not forget that a whack of cash is paid out in the form of life insurance when you die). The cost of whole life insurance for a child is cheap, and never increases. The cash value is intended to be a nest egg for you. I need cash now. Do I cancel the policy? No! First of all, you parents could very well have you drawn and quartered if you cancel the policy before it reaches “maturity” – which in their eyes means a hefty cash value, probably projected to happen when you reach retirement. If you need cash now, there are a few ways to accomplish this while still keeping the policy alive. The best way is through doing a policy loan, which we’ll describe shortly. I really can’t afford the premiums right now. Do I cancel the policy? No! If you are sinking under the weight of still paying premiums, again you may be tempted to cancel the policy, with the promise of not only a reprise from monthly payments, but also a wad of cash being handed to you. Again, I urge you to consider other options, discussed below. What happens when I cancel a whole life insurance policy? Your life insurance coverage stops. For good. You can’t change your mind and get it back. Getting new insurance at your age will cost exponentially more – and that’s if you are healthy and fit. If you have an illness that affects your insurability, you could be outright rejected. You are over the curve of payments. By the time your parents give you the policy, most of the hard work is done. All the policy really needs now is time, for the cash value to grow and compound – tax-free I might add. If you throw in the towel now, all your parents’ hard-earned payments towards your future are wasted. You’ll get the cash surrender value paid out to you. This is the beautiful carrot, which dangles in front of you each time you receive a statement, and are hard-up on cash. But this cash value paid out to you is also fully taxable. If the insurance company doesn’t withhold tax off the top (and even if they do), expect to end up paying extra when you file your taxes. Okay, I won’t cancel my policy. But can I make withdrawals from the cash part? No! (Well, yes, but really – you shouldn’t). For the same reason that you will get a tax bite from canceling your policy, making a direct withdrawal from the cash portion is costly in the form of tax. And since you are already earning an income through work, you will be taxed at your marginal rates, which could be high. Just…don’t go there. How do I stop paying premiums now? If you are hard-up for cash and want to know your options, call the insurance company, asking about a “premium holiday” or “premium offset” option. They will run the numbers on your policy as it stands today, and if there is enough money in the cash value and annual dividend payments to pay the premiums for you, they can arrange to do so. It is ideal to ensure that your cash value is large enough that it won’t erode with ongoing premium payments, since that would mean eventually you will have to start paying premiums again, and that the compound growth of the cash value will be severely affected. It is quite counterproductive, but possible; depending on your situation, you will know if it is necessary. How do I access the cash part without the tax bite or canceling the policy? Ah, here is the fun part. You need money, but your parents will kill you if you cancel the policy. Or let’s say you’ve been a good child, paid all the premiums, let the policy grow to maturity, and now you are ready to do something with it. If you play your cards right, you can access the cash value – which has grown and compounded tax-free – without paying a dime in tax when you pull it out. Let’s repeat: You just invested money tax free, and pulled it out…tax free. This is why some whole life (or permanent) policies are worth their weight in gold. Your ticket to such a loophole comes in the form of a “policy loan”. You aren’t actually making a withdrawal from the policy; instead you are borrowing against the cash value. The insurance company will usually arrange this for you, and at favorable interest rates too. Let’s say you have a cash surrender value of $30,000. In order for the loan to work, they cannot lend you the entire amount though. They will lend you an amount large enough so there is enough money left in the policy such that the cash plus annual dividends can cover your loan payments (or at least the interest owing on the loan, if you can get an interest-only payment option) over the projected time of the loan. In some cases, the bank will simply accrue the interest payments to the loan amount itself, using your policy as collateral; allowing your cash value to continue to grow as if nothing happened. To do this though, the insurance company needs to be conservative enough to allow for interest rate increases so your policy doesn’t lapse over the term of the loan if prime rate goes up. So they will lend you, say, $20,000 (for argument’s sake. Factors that go into calculation include your age, the size and terms of the policy, and the performance of the cash value to date. The older you are, the more money you will get as a percentage of the total cash value). When you die, the insurance company (or bank) gets the money owed to them from the loan (plus interest, if it wasn’t paid with annual dividends), and the rest of the cash plus the insurance component is paid to your beneficiaries. This policy loan strategy works well as a way to supplement retirement income in a tax-free fashion. Instead of taking out a lump sum loan, you can opt for annual loans to supplement your retirement income. Or you can pull out the lump sum and invest it elsewhere, if your income and tax situation allows for it. If you can hang in there until retirement, this whole life policy that your parents bought can be a great investment for you; a big help and an alternate nest egg. Note of caution: Although the policy loan strategy is a viable one, it is not without risks. The bank could call the loan at any time – a risk with pretty much any loan. If such an event could financially cripple you, then you may wish to reconsider the amount of the loan, or whether it is worthwhile to take the loan out at all. Although it is a remote risk, it is worth mentioning. I'm going to print this out and put it with our insurance papers for the future. I know many people now suggest term rather than whole policies but we got the whole as a way to help us save (as well as protection). Our insurance is through the Knights of Columbus, which has some great benefits since it is a non-profit. We got small policies on the children which would cover funeral costs if something were to happen (we were friends with a family who became not only emotionally devestated by financiall devasted after the loss of a child) however, as I understand it they can increase the ammount of the policy when they are older without having to go through the ratings system -- which could end up being a huge benefit to them. Excellent overview! Many people don't fully appreciate life insurance's ability to act as a tax free loan "piggybank" which works best when you overfund the policy. Thank you so much for posting this! I have a whole life policy and it has never been explained to me so clearly. I haven't read all of this yet, but my wife just got handed her papers from her parents on her whole life insurance they had been keeping up since birth. I was hesitant against continuing such a policy and wasn't sure what to do. This will help immensely. My parents had a policy set up for me and in my 30s I cashed it out to do something stupid -- buy a computer. If I'd have left it alone now -- 20 years later it'd be work 10 times that amount. although I would never open a new Whole life (see Suze orman's thoughts on this) I do wish I'd have kept what my parents gave me. A whole life policy is a HORRIBLE investment, it's overpriced and doesn't pay what people think it will. For about a tenth of the price you can get term life. I agree that it is a horrible investment. If you want to invest, then invest. If you need insurance, get insurance. The reason the premiums stop at some point is because people horribly overpay up front. I also trust Dave Ramsey's advice on this. Whole life may or may not be a good investment. It depends on the specifics of the policy. What are the fees, what is the interest return, what are the sales commissions, what is the full insurance coverage level? You have to answer ALL those before you can really make a judgment saying if whole life is a good investment or not. If you already have a policy then deciding to keep it or not will depend on the payments required and how much its really worth. If you already have one it may be more worthwhile to keep it than if you were examining starting a policy from scratch. Or maybe not... it really depends on the policy premium and its return rate. I've read somewhere that "Dividends" from insurance policies aren't real "Dividends" but return of overpayments of payments made to the policy. It may it different because i live in Canada, but i've never seen any tax slips regarding Dividend on the Insurance policys my parents have pruchased for my sisters and me. If theyare true dividends aren't they taxable income? @Guest re: dividends - You won't find any tax slips for dividend payments because this is an insurance policy. Growth of cash values or investments components within insurance policies are tax-free, and (if you do a policy loan) are even tax-free upon "withdrawal". And for the naysayers of whole life insurance, I agree that some policies are better than others and no two policies are the same. When I was in the financial planning business, I almost always recommended term insurance for actual life insurance needs, and only occasionally used whole life (I preferred Universal Life for its flexibility) for specialized investment needs in certain circumstances. This article however, addresses insurance policies that have been invested in by parents for their kids, having paid premiums for decades. Once that much money has gone into a policy, you must really give it a close examination before canceling it on the premise that "whole life policies are horrible investments". While the loan from your policy may be tax free, the loan itself is not interest fee. In effect you pay the insurance company interest to borrow money you should have already had in your pocket. Thanks for letting us know all the details of a whole life policy. Investigate term life insurance. If the premiums are less than whole life insurance (which they probably are), buy the term life insurance. Cash out the whole life insurance. Invest it in something that actually makes money (rather than the negative return that whole life guarantees). Don't touch it. By the time your term life insurance expires, that money alone will go a long way toward self insuring you. @Robin - Cashing out a policy based on a blanket idea that whole life is bad and term life is cheaper can be wasteful on a number of levels (please read the article for the reasons why). It pays to truly investigate your options. No two whole life policies are the same; read the fine print and consult an unbiased expert. PS - I have no vested interest in promoting whole life, and in my 10 years in the financial planning industry, I only arranged for 2 whole life policies for clients, and it was because the clients specifically requested them (for their kids). As a general rule I vastly prefer Universal Life to Whole Life, and Term insurance over permanent insurance most of the time. But I have also seen many clients who already had whole life policies, and would take huge tax hits and would lose money invested in the policy to cash it out. There are always options. This tax hit you see usually isn't there. Your basis for the policy is the amount you have already paid in. It's rare, except in long duration policy situations for the policy to have a cash value that exceeds the basis. And even then, your tax liability is only on the gains over the basis. Thankfully you're not my financial planner. If you cancel the policy for the cash surrender value you only have to pay income taxes on the investment buildup (i.e. the difference between the cash value and the amount of premiums that were paid). On most of these policies that were taken out on us as children the cash value is rarely higher than the premiums that were paid in and so most people don't have to pay taxes. In general some good points pro and con in the comments. One point is that I take exception to the statement that "Getting new insurance at your age will cost exponentially more" provided under the reasons why not to cash it in. Assuming we're talking about getting a policy in your early twenties from a parent, a quick check at an insurance web site showed: 100 K policy, 23 year old non-smoker in decent health, $20/month for 20 year level term or $86/month for whole life. Using 3% inflation, the $86 quote would be about $43/mon 23 years ago. Hardly more, and definately not "exponentially more". Even if the comparison is whole life to whole life, two to three times what you would pay now is not exponentially more. That said, I feel the important point whenever you have to make a financial decision is not to follow advice from anyone blindly. They are not in your shoes. You need to weigh a few options, run some basic numbers, be honest with yourself if you'll just fritter the cash value away or really use it on something to make yourself financially more stable (which I would believe is what parents really want for their kids), and then make a decision that fits your life and values. Thanks, Peter - and all the commenters (both pro and con) thus far - great advice all and all. Keep it coming! I contacted the insurers lately to update my address details. The salesman offered to "change my policy to a more modern version". I don't know if he was naive or if this is company policy, because they simply don't sell whole of life (as far as I can find) in Australia anymore! Thanks for this post - hopefully it will help explain things to my uninsured husband who is bemused by the monthly payment to something he doesn't quite understand! Nerida, I asked a relative who is in the Insurance area if Whole Life/Permanent was available in NZ and he said most companies had dropped it but AIG still sell it. I'm sure they will be in Australia. through a Armed service Entrance Control Station, or maybe MEPS, where medical doctors give you a total medical exam. My parents got whole life in 1991 with equaltible. Just last year an agent came to our house and told them that their whole life insurance had been changed to term about 8 years ago. He told them that the company had switched over and the reason why they are just now telling them is b/c the insurance company had been behind. I was wondering is it legal for the insurace company to do that b/c when the policy switched to term it stoped gaining face value which was a lose for my parents. Whole life has so many living benefits. Anyone who has one should contact an agent to have an illustration done for them. Policies that are over twenty years old are just coming into their prime and getting ready to explode in terms of compound interest. Instead of buying a new car and financing it through the dealership, or worst yet leasing a car, loan yourself the money by borrowing it from your whole life insurance policy. Then make the same payments that you would have made to the finance company back to yourself. You effectively become your own bank! I suggest my clients consider a mix of term and whole life, using the whole life as their own personal bank. Mikey B...you have hit the nail on the head. I am just learning about creating your own bank. If only I had learnt about it 40 years ago! My father purchased a $1,000 whole life policy in 1943 has paid $20.00 a year on it. Would this policy just pay out 1,000. He is 91 yrs. old now. That's insane. He's paid $1400 for $1k in coverage. That's assuming that the dividends didn't increase the premiums. b) be a cushion for the policy owner to borrow against now. Here's the rub with whole life insurance. The beneficiary doesn't get both the face amount plus the cash value upon death. The acid test is that if you had an outstanding loan balance on the policy upon death, the loan amount would be deducted from the face amount to represent the death benefit. This is why you never mix insurance with savings because the beneficiary never gets both. Typically, life insurance sales people earn 5 times more compensation selling whole life versus term. Who do you think pays for this difference. The consumer of course. I have a policy my parents got for me in 1966 for a thousand dollars. They both have passed away and I have already given my body to science when I die. How much is my policy worth and how do I cash it in? If my life insurance policy reached the premium offset date should I sign the premium offset payment arrangement or should I keep paying the annual premium to build up my cash reserve and grow my insurance through the purchase by dividend. My parents had signed me up for whole life insurance when I was born... so glad they did. Maybe a lot of people don’t think much about the importance of paying for an income protection insurance today. However, tools that compare income protection insurance policies will give you an idea of why this is important and why you should take time out from your busy schedule to learn more about it. If you’re not keen to talk to a financial advisor about this type of insurance, you can educate yourself with the basics and have your questions answered by the myriad of free comparison tools available on the Internet today. As with any other type of insurance, it is always better to know why you need it and why it can secure you in the future. Use cheap term insurance to replace you income for your family in the event of your untimely death during your prime earning years. Use permanent life insurance with "paid up additions" rider to create your own financing tool for today and for retirement income options later on down the road. Anyone who condemns one in favor of the other is not looking for your best interests, they are looking to for the sales commission. I gotta share this; at my two sisters and brothers birth my father bought life insurance policies for each of us. I didn't know I had it until 30 years later. It had a cash value of around $1,000. I was tempted to cash it in but it had a death benefit of around $3,000. The wife and I decided to sit on it. In 1999 Standard (the company that the life insurance was through) transitioned to a stock insurance company and I received 68 shares of stock, worth around $1,500 ($22 a share). Again I'm tempted to cash out but I sit on it. Later at $100 a share the stock split. Value at about $7,500. And again I just sit on it. The stock went to $78 a share (value is now around $10,000) when a Japanese company bought them out. $115 a share. A short time later I got a check for $15,640. My brother and my two sisters had cashed their policies in a long time ago and gotten their $1,000. My opinion is DON'T CASH OUT UNLESS YOU ABSOLUTELY HAVE TO! My mother just handed me a policy she took out on me in 1969 and I am 62 and she is 90. how can I find it's value face value says6600.00 which was paid up in 1989. What could it be worth now? This was a good article, and informative for the audience to which it was intended. I am so disappointed in the comments to this article, especially the negative comments and in particular, misinformation about the aspects of whole life, albeit I can only speak for the Canadian versions. I am life licensed in 6 provinces, and contracted with 25 companies, 13 years in the business, so am considered reasonably knowledgeable by my peers. I sell an average of 2 policies a week, and probably 80% of them are term 10-35, level or decreasing, as that is what most people need and can afford. Of my permanent sales, probably 85% are Term 100 , minimum funded universal life (UL) minimum funded, i.e. no cash value, as in Canada we have something called the Tax Free Savings account which offers a better solution for investment money compared to a UL policy for most people. My whole life sales are primarily for children, I bought them for my two grandsons 11 years ago, and their performance is better than the current dividend scale, with both the death benefit and cash value growing annually. The whole life most commenters are describing here are the guaranteed death benefit, guaranteed cash value camp, which many do not allow access to the cash value to borrow against, and none that I am aware of, on death, pay other than the starting death benefit, i.e. the cash value is lost. I have had the rare person who has wanted this type of whole life, but I try to discourage them if I can. So to summarize, it is impossible to make a generalized statement about any life insurance product, as there is variety for a reason, and an experienced life insurance agent with the client's best interest at heart, (I have inherited several policies over the years where this I not the case, and includes the agent I had for 20 years, before realizing he was only interested in padding his pocket, rather than what was best for me). For some of my clients, I have recommended a combination of permanent and term to meet their short, medium, and long term goals. One test of an agent's competence is to ask if they use Excel, and can they show you a comparison of different plans? If they can't move on, as not being able to use Excel in this business, means the agent can't gain the insight only Excel can show. I was adopted as a child, and was recently told that I have a life insurance policy in my name. I do not know where to go from here.? My mother lives upstate NY, and I doubt she will hand over the papers. What should i do? 1-Why should I have to "borrow" money that belongs to me, and pay back my OWN money with interest? 2- Why invest money into an account that grows between 1%-3% (as whole life policies do) when I COULD take the SAME money and invest in a good mutual fund that earns between 8%-%10? 3- Why would I allow the insurance company to keep my cash value upon my death, when I MYSELF was the one that was paying for the cash value the whole time? Put it another way. Say you went to your local bank and were thinking of opening an account with them. They list all the same things you mention as being reasons why cash value life insurance is such a great deal. Would you seriously open an account with a bank that forced you to access YOUR OWN MONEY by loaning it to yourself? Would you open the account if you knew you could get a 3x better interest rate at another bank down the street? Would you open that account if you knew they would KEEP YOUR MONEY in the event of your untimely death? No thinking person would. And people would do well to consider the alternative school of thought before fondling their cash value life insurance policies.